A Senate committee on Wednesday advanced a measure to ease the process for President Trump to reorganize the federal government, but lawmakers included a provision to ensure any such reforms would require bipartisan support. The 2018 Reforming Government Act would begin the legislative process for the Trump administration to implement the proposals the White House unveiled this summer in its reorganization plan, which included 32 distinct recommendations for reshaping an array of federal agencies. Congress has not granted a president reorganization authority since 1984, and President Carter was the last to actually use the power. The measure would not give the White House carte blanche to start implementing Trump's proposed reforms. Instead, it would provide a pathway for those recommendations to go before Congress for consideration. Trump would still need to send his formal proposals to lawmakers, who would then have 90 days to approve them. If they took no action, the plans would not advance. The president would have two years to officially send his suggestions to Congress. An amendment added to the measure during the Homeland Security and Governmental Affairs Committee markup, introduced by Sen. Heidi Heitkamp, D-N.D., would make the process for authorizing any individual agency reform significantly more trying. The change would require any reorganization proposal to receive 60 votes on the Senate floor, instead of the normal “fast track” of 51 votes typically afforded in the previous authorizations. The chamber could bypass the higher threshold only if five members of both parties cosponsored the reorganization resolution. Heitkamp’s amendment would also require the Congressional Budget Office to conduct a financial analysis of any proposal once the president sends it to Congress. Trump must include with any official proposal a financial analysis associated with "maximizing the net benefits of the implementation of the plan" and describe how it would improve the management of government and delivery of services. The statement would also have to include a detailed implementation plan and what preliminary steps agencies had already taken. 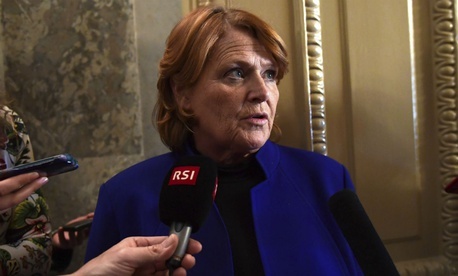 A Heitkamp aide said past attempts to move reorganization legislation faltered because they made it possible for a single party to advance proposal on its own, without input from the minority. In addition, the aide said, past legislation did not provide for a similar degree of scrutiny into the details of the proposals and their impact on affected agencies. The legislation builds off previous reorganization authorities, which spelled out the tight time frame for congressional approval. The underlying measure would also require the Office of Management and Budget to identify cost savings and require that the proposals lead to a net reduction in spending. President Obama requested reorganization authority in 2012, but Congress did not provide it to him. The House has introduced a companion measure, but it has yet to receive any vote. Among the changes Trump has proposed are merging the departments of Education and Labor, dramatic changes to the Agriculture Department and its food assistance programs, privatizing the U.S. Postal Service, and stripping the Office of Personnel Management of its independence and shifting its benefits delivery functions to other agencies. The White House has said some of its proposals would require legislation, while the administration has the authority to unilaterally implement others. Lawmakers have already taken some steps to prevent the Trump administration from taking action without congressional approval. Many of the proposals have received bipartisan pushback in a series of hearings held since the White House unveiled the plan.